These machines provide all-in-one welding features for stick, MIG and TIG welding- so they are especially dynamic options if you are in the market for a complete welding macine (Source). Many buyers purchase them to perform repairs and maintenance, light industrial work, and for automotive, boat, farm and fabrication applications (Source). The Forney multiprocess welder is one of our favorites- garnering some of the most positive reviews from its purchasers. It does come in a variety of sizes, so you'll have to pick the best power options for your job, ranging from a 125 Amp to a 270 Amp. Across the board, users were impressed by the value and performance of this multi process welder, saying that it boldly differentiates itself from lesser-quality options, even though it is not a Lincoln or Miller welding machine. Its processes include MIG, flux cord, TIG and stick. It is able to do Flux Core welding but has the ability to be switched over to perform Mild Steel with its gas set up. Its manufacturers also promise that it can easily be switched over to charge and run stick electrodes. User feedback is pretty positive for this welder- with many buyers happy that they got a three in one welding machine at a reasonable price. One buyer who works with a lot of metal says that he has used a variety of different welders over time, and this Forney welder has destroyed the competition. He does say that it works best if you are cognizant of its limitations- it is not the sort of multi process welder that can be used for heavy-duty projects and repairs, but it is capable of working on 1/4" metals, just not 1/4" steel. Let's take a look at five of the best-selling multi process welders on the market today and see how they compare. 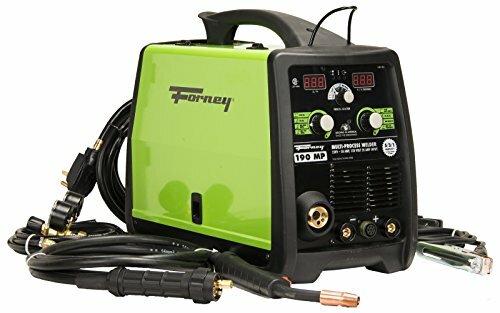 The Forney multi-process welder is powerful, well-constructed and suitable for any professional welder. Users love the digital readout screen, but some do note that they received a dented machine in the mail- though this was pretty rare. This multi-process welder has a maximum output of 190 amp, a cast aluminum drive system, a euro-connect MIG gun, a regulator, a gas hose, a 4.5m power cord, an adapter plug for 120V, and a start-up guide. It weighs 43 lbs, and you can use it for the following processes – MIG, Flux-cored, Stick and TIG, but you’ll have to buy the TIG set up separately. Overall, this is a welder of high-quality and price, and it has synergic welding capabilities. In general, buyers are pleased with the quality, performance, and functionality of the Forney 3-in-1 welder. One customer shared that the used the MIG and flux core welding processes and they both worked without a flaw, and there was minimal spatter. The reviewer states that he would recommend it to anyone looking for an all-in-one welder. Another customer mentioned that the digital readout is a nice feature that allows him to adjust the power and the precision of his welding and as a result, his welds are now smoother than before. A user comments that this multi-purpose welder is well-made, comfortable and performs beyond his expectations. The reviewer also states that he was surprised how well the welder works on 120 volts. However, one customer has complained that the on/off switch is located on the back and it’s not comfortable to use. If you are a welding novice who needs a reliable welding machine, you might take a look at the Lincoln Electric multi-process welder. Users love that it’s easy to set it up, but some do note that it’s very expensive. With a weight of 40 lbs, this multi-purpose welding machine has a dual voltage input – 120 V or 230 V, push-and-turn digital controls, a large color display, a metal wire drive, and sheet-metal construction. There is also an ultra-flex TIG torch and a foot pedal included, but you’ll have to buy the spool gun separately. As a whole, users are extremely satisfied with the versatility, functionality, and performance of the Lincoln multi-process welder. One buyer shares that the preset settings are an excellent feature if you are not a professional welder and that it works great both on sheet metal and thick steel. The reviewer also states he would recommend this 3-in-1 welder to anyone who wants to have three machines in one portable and lightbox. Another customer mentions that he is extremely impressed with the MIG process. He used it to weld 450 linear feet of corral panels, and the Lincoln MIG welder did the job flawlessly. However, some customers have complained that they have problems with the wire feed and that the gas regulator is poorly made. This multi-process welder offered by Everlast is well-constructed, powerful, light and a good choice for any professional welder. Users love the high-quality design, but some do note that you have to buy the spool gun separately. 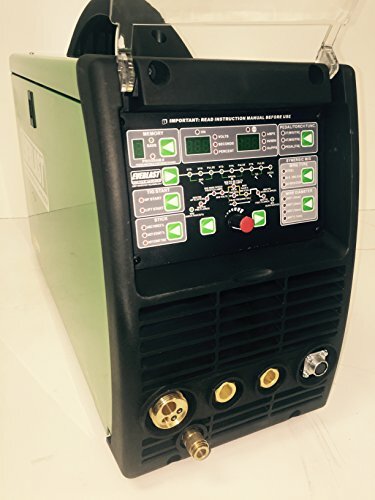 With a maximum output of 250 amps, this multi-purpose welder has a digital inverter construction, a dual voltage input, a euro fast-connect MIG gun, a digital readout, and various advanced options (HF or lift start for TIG, for example). In addition to the standard MIG, Stick, and TIG welding processes, the Everlast multi-process welding machine also offers synergic MIG, and pulse MIG and TIG welding modes. In general, customers are happy with the construction, powerfulness, and performance of this 3-in-1 welder. One buyer mentions that the synergic and the pulse mode work smooth and flawlessly and that all the accessories that come with this welder are of high quality, especially the foot pedal. Another user shares that he uses the Everlast multi-functional welder on 110 V with no issues and that he is very pleased with the quality of the TIG set. A happy customer commented chose this multi welder due to the extra modes and accessories that were included, and after six months of regular use, he is extremely impressed by its capabilities. Another user said that he was worried that it would be too complicated to operate this welding machine, but it turned out that the control panel is easy to figure out. However, some purchasers have complained that the instruction manual is useless and they had troubles using the different welding modes. 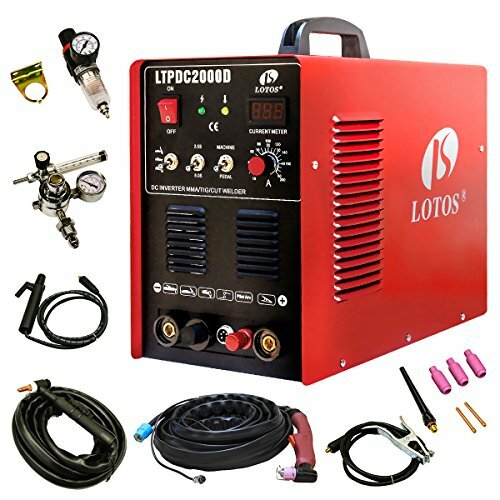 If you are looking for a welding and cutting multi-purpose machine, you might take a look at the Lotos 3-in-1 welder and cutter combo. Users love the plasma cutter feature, but some do note that the consumables for this welder are specific. 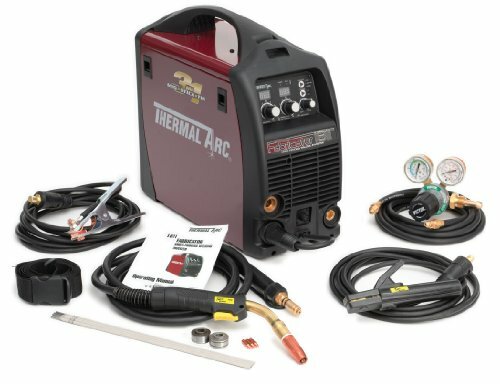 With a size of 15.5″ x 8″ x 12″ and a weight of 43 lbs, this multi-process welding machine has 50-amp inverter plasma cutting mode with a maximum cutting thickens of ½ inch, 200-amp TIG and stick welding mode, automatic dual voltage, and some TIG accessories. Overall, it’s relatively inexpensive 3-in-1 welder, but it has some performance issues. Users have a mixed reaction towards the Lotos multi-process welder and its integrated plasma cutter. One buyer mentions that he uses mainly the plasma cutting feature and he has no problems to cut through 1/4″ of mild steel. Another reviewer shares that multi-purpose welder is versatile, accurate, easy to use and very useful to have around his farm. A happy user comments that it cuts through metal like its butter and he was surprised how well the TIG and stick weld mode worked. But reviewer also notes that the instruction manual is pretty useless and difficult to understand. Some other customers have complained that the power cord and the welding leads are short and that the packaged arrived in poor condition. A couple of users also complain that the Lotos 3-in-1 welder stopped working after several uses or that they couldn’t even turn it on. This 180-amp multi-process welding system offered by Thermadyne is portable, efficient and versatile. Users love the lightweight, compact design, but some do note that the package doesn’t include a TIG set up. With a size of 20.50″ x 15.60″ x 24.50″, this portable multi-purpose welding machine has up to 180 amps of welding powers, three welding processes available – MIG, Stick, and TIG, and it weighs only 33 lbs. This welding multi-function machine also comes with a MIG torch and tips, an electrode holder, a regular, a hose, a ground clamp, drive rolls and sample electrodes. In general, some users are pleased with the Thermadyne multi-process welder, while others have some serious complaints about its performance and functionality. A buyer mentions that the 3-in-1 welder worked for about one week before it broke, but the customer support was very helpful, and they sent him a new welder. The reviewer states that the Thermadyne multi-process machine is useful and works great when it’s not broken. Another customer shares that the welder works flawlessly in all modes – he welds steel with it smoothly and without much effort. A purchaser states that he uses this 3-in-1 welding machine for small repairs and home projects, and it worked better than he expected, but he would have preferred if there was a dual voltage option available. Some other customers have complained that the tips fall off the MIG gun and that the sticks don’t weld smoothly. The primary types of welding found in industry and by home hobbyists are generally known as Mig welding, Arc welding, Gas welding and Tig welding. TIG welding resembles oxy acetylene gas welding and requires much more know-how from the operator. Useful for undertaking top quality work whenever a exceptional quality of finish is necessary without employing too much cleanup by sanding or grinding. Often known as stick or arc welding. Arc welding is easily the most standard of all welding types, is straightforward to perfect in the home for a variety of welding circumstances. Stick welding can be used for manufacturing, construction and repairs, very much well suited for heavy metal size 4 millimetres upwards. Thinner sheet metals and alloys are usually more suited to the MIG welding types. Not employed as extensively for basic welding of mild steel. Is made up of mixing oxygen and acetylene gas to create a flame able to melting steel materials. It is primarily utilized nowadays for servicing work and gas metal cutting. Additionally it is common for brazing softer metals, for example copper and bronze. Additionally called MIG welding this welding type is easily the most commonly used and possibly the most effortlessly mastered variety of welding for business and residential use. The GMAW process would work for fusing mild steel, stainless-steel in addition to aluminium. WHAT ARE FELLOW WELDERS SAYING? 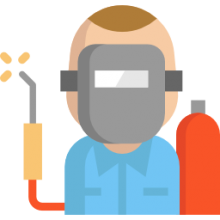 When people look to purchase the best multipurpose welders, they typically go online to find reviews and then head over to a local retail store like Home Depot to make the purchase. However, you might be best served and get the best price if you buy online. The Forney was one of the best rated multiprocess welders among the users we surveyed. T﻿he ﻿Forney is certainly one of our top picks with a host of buyers endorsing its overall value. One reviewer advises fellow welders that a lot of gains can be made in welding power by doing some preparatory work- cleaning the material that you were going to weld so that there is no crime, grease or dirt in the area. You'll also want to have stable ground for a powerful ground clamp. Once you have completed some of this prep work, he says that this particular multi process welder can do a variety of light to medium jobs. He does caution that you are not getting a particularly heavy-duty machine, but if you are a garage mechanic, a home hobbyist and DIY or installation artist, this welder could be a significantly valuable addition to your home toolbox. Another buyer that works as a professional installation artist, working with metals, says that he was particularly impressed by the combination of value, performance and quality of this Forney multi process welder. What he particularly likes is the precision and adjustability of its power and the digital readout capacity is also highly useful. There are actually a variety of different models available this multi process welder at different amps- so make sure you select the model that is a best fit for your particular purposes. The Everlast ﻿﻿﻿PowerMTS was another solid digitally controlled welding option. 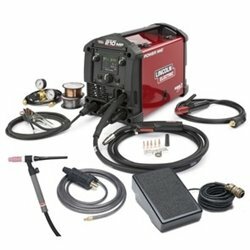 Again, this welding machine received a lot of positive feedback- with users in general saying that it was decently priced, that the TIG and MIG torches are nice quality, the foot pedal is easy to use and constructed well, ships with a variety of TIG torch consumables, and also includes a handy ball regulator. That said, some users did point out a few negatives. One issue people had is that in shipping, because this is a relatively heavy object, sometimes it can arrive with a few dense and dangerous. Buyers advise to look over your device very carefully when you receive it and make sure that it is free of any damage. Another annoyance is that it didn't ship with any instructions, which many experienced users didn't require, with other novice welders consulting YouTube video tutorials to get it up and running. One buyer also commented that his primary grievance with this particular machine is that it didn't ship with any consumables for the MIG torch- he had to go and order a difuser and tip online because his local Home Depot didn't offer it for this particular model. Another home hobbyist to purchase this multi process welder says that primarily he's been working with it on 230 V power on the MIG and TIG processes. He comments that he works primarily with heavy steel rebuilding and that it has welded beautifully, outperforming more expensive brand items, and everything was included that he needed to get it up and running out of the box. Another buyer says that while it was annoying that the machine didn't ship with instructions, he found that the front panel interface was highly intuitive and easy to learn. He also was appreciative of the phone support he received from Everlast. So, if you are in doubt concerning this particular Everlast multi process welder, you can go to their website and give them a call-they'll help you make a quality buying decision.